Would you undergo an elective surgery if your body was ill-equipped to recover and you would likely have surgical complications? The obvious answer is no, yet thousands of Americans pursue plastic surgery without knowing whether their bodies are prepared for it. Because of nutrition deficiencies that are increasingly common today, Dr. Hochstein offers every patient at his plastic surgery practice the option of preoperative and postoperative IV therapy to help ensure a pleasant, complication-free surgical experience followed by quick healing and recovery. These treatments are done in his state-of-the-art medspa, Hochstein MedSpa. According to the Center for Disease Control, the standard American diet has led to many nutrition deficiencies and excesses such as too much sodium, not enough dietary fiber, and alarmingly decreased levels of vitamin B6, iron, vitamin D, and other essential nutrients. In addition to fast food and processed food choices, poor nutrient absorption affects millions of Americans by inhibiting the body’s ability to digest and absorb the nutrients that are consumed. Without proper nutrition, the body is not adequately armed for healing and protection against infections and illnesses. This becomes critical after a major surgery because poor nutrition can delay healing and leave patients vulnerable to infections and other surgical complications. IV therapy provides optimal vitamin supplementation for patients before and after their surgery to improve the body’s ability to recover. Patients who are at a higher risk of complications, such as those who are obese, overweight, diabetic, or poorly nourished, can benefit significantly from IV therapy. 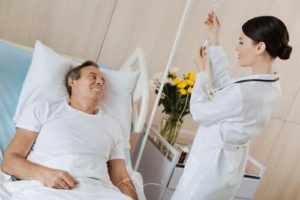 IV therapy is typically offered as one nutritional IV before and one nutritional IV after your surgery accompanied by oral nutrition supplements. Replacing essential nutrients through IV therapy reduces free radicals caused by anesthesia and surgery and also improves the immune system response so that patients have less bruising, reduced swelling, and better wound healing. Helping your body function at peak efficiency helps to prevent infection, reduce bleeding, improve collagen formation, and even minimize scarring. IV therapy can support your body and help you achieve the best possible outcome with minimal scarring and a fast recovery after plastic surgery.